Heartworm Disease- What is it? Why is it so Important? The warm weather is coming soon, its almost starting to feel like spring! With warm weather comes mosquitoes which can transmit heartworm disease to our dogs (and cats extremely rarely). Heartworm disease can be a fatal disease, but an easy disease to prevent with the appropriate medication. Heartworm disease occurs most commonly in areas with prevalent mosquitoes, such as along the Great Lakes and other waterways and coastlines. Windsor, Ontario is one of the most prominent locations for heartworm disease in Canada due to our warm weather and the surrounding Great Lakes. When a mosquito takes a blood meal from a dog infected with heartworm it ingests microscopic heartworm larva in the infected dog’s bloodstream. These larva mature further within the mosquito before making their way back to the mouth parts of the mosquito. When the mosquito bites another animal, these microscopic sized heartworm larva (microfilaria) can be injected into the bloodstream of a dog or cat and then make their way into the heart and blood vessels to the lungs. Over the period of 6 months, the worm grows to be an adult, ranging in size between 6-14” long and 1/8” wide! At the largest size, that is over a foot long, and thicker than a piece of cooked spaghetti! Adult heartworms can live up to five years, and during this time, the female can produce millions of microfilaria to circulate through the dog’s bloodstream. 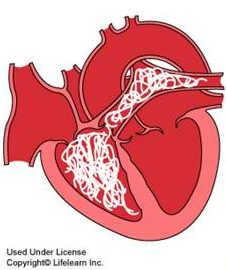 The worms mainly live in the vessels of the lungs and the heart (hence the name, heartworm disease). As you can imagine, having worms living in the bloodstream can cause difficulty with normal functioning of the heart and lungs. With an increasing number of worms, more damage is done to these important organs. Animals can appear short of breath, have a cough, faint, be lethargic, or if only a small number of worms, may not show any signs or symptoms at all. By the time clinical signs are seen, the disease is typically very well advanced. At our clinic, we recommend yearly testing of all dogs for heartworm disease. This is a simple blood test to detect adult worms in the bloodstream. If our dogs have not acquired heartworm disease, they are kept on a monthly medication to kill any microfilaria from mosquitos they may have picked up from the last 30 days. The most important months of the year for heartworm prevention is May through November, but with our weather varying from year to year combined with our proximity to the Great Lakes, we highly recommend yearly heartworm prevention. What happens if my dog acquires Heartworm Disease? If a dog tests positive for heartworm disease, there are multiple diagnostic tests which are done to help determine the severity of the infestation. First tests include: repeating the heartworm test to ensure it is not a false positive, regular bloodwork to ensure the other organs are functioning normally, radiographs of the chest to evaluate the health of the heart and lungs, and may proceed to tests such as a cardiac ultrasound. Once a dog is deemed to be healthy enough, we would proceed according to the American Heartworm Society’s Guidelines for treatment based on the severity of the disease. The treatment can be intensive, expensive, and does not come without risks. For these reasons, it is much safer for your dog, and less costly, to be on a monthly preventative medication than to need to go through treatment. For more information, give us a call about heartworm disease, prevention, and testing so we can tailor a plan appropriate for your dog!